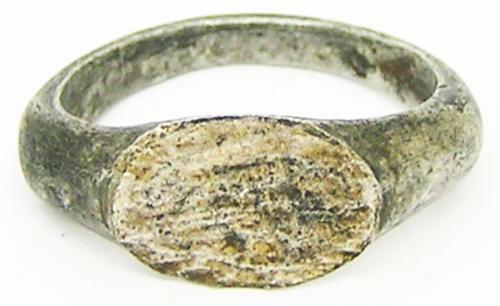 This is an ancient Roman silver intaglio ring, dating to the 2nd - 3rd century A.D. It is of Henig's type III (2007, 9) and Guiraud's type 2d (2003, 79), a type dated to the second to third century AD. Henig, M. 2007. A corpus of engraved gemstones from Romano-British sites. BAR 8, 3rd edition. Oxford, Archaeopress. Guiraud, H. 1988, 2003. Intailles et camées de l'époque romaine en gaule (Territoire français). 48th supplement to Gallia. Paris, CNRS. The ring is intact, though originally would have been set with an intaglio (the raised setting appears to have been removed in antiquity, perhaps when the intaglio was lost). The ring is without any cracks or restorations and can be worn with care.